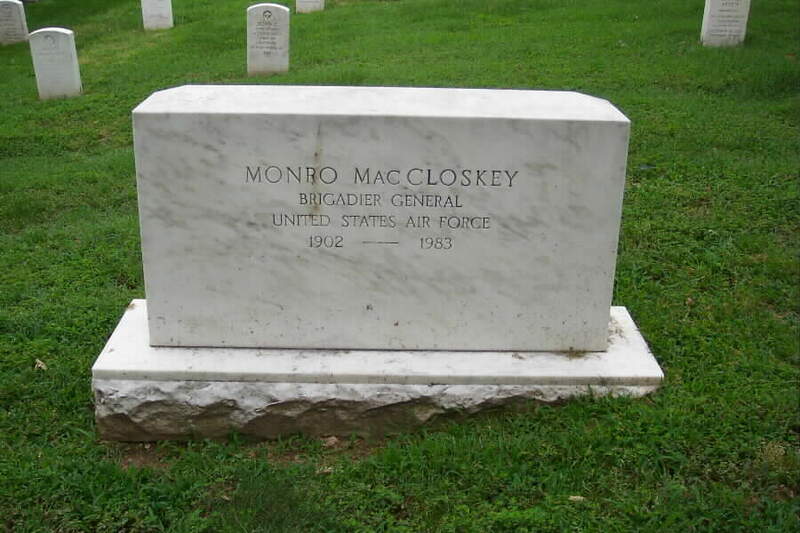 Monro MacCloskey was born in Fort Worden, Washington, in 1902. After graduating from Western High School in Washington, D.C., in 1920, he entered the U.S. Military Academy where he graduated and was commissioned a second lieutenant of Field Artillery on June 12, 1924. He resigned his commission on August 13, 1924 and on August 2, 1926 was appointed a first lieutenant in the Ordnance Reserve, from which he was honorably discharged on September 10, 1929. On November 19, 1934 he was appointed a First Lieutenant of Air Corps in the National Guard of the United States. After resigning his Regular Army commission, General MacCloskey was a salesman and building manager in the real estate and insurance business in Chicago until recalled to active duty in February 1941. He graduated from the Edgewater Flying School at Chicago in 1931 and from the extension school of the Army's Command and General Staff School in 1935. The general received his commercial pilot's license in March 1934 and his pilot's rating from the Air Corps on April 23, 1934. Recalled to active duty on February 3, 1941, his first assignment was as operations officer of the 108th Observation Squadron at Chicago, Illinois. In July 1941 the general was assigned to the Operations Section at Army Air Force headquarters in Washington, D.C.
General MacCloskey was transferred to headquarters of the U.S. Army in the European Theater in August 1942 for duty in connection with plans for the invasion of North Africa and the organization of the 12th Air Force. In September 1942 he was appointed deputy to the assistant chief of staff for operations of the 12th Air Force in the North African Theater. The following January he was named chief of the organization, training and equipping section of the North African Air Force. In March 1943 the General became a member of the joint planning staff of the Mediterranean Air Command, in which capacity he helped to plan operations in that theater. In January 1944 he was named assistant director of air plans for the Mediterranean Allied Air Force and during March and April he planned the equipping and training of heavy bomb squadrons of the 15th Air Force in Italy for supply dropping operations. The following month General MacCloskey assumed command of the 122nd Bomb Squadron that was engaged in supply dropping operations in Italy and in June became commander of the 885th Bomb squadron, also engaged in the same operation. In January 1945, the general was appointed commander of the 15th Special Group and two months later was named commanding officer of the 264lst Special Group. These two units also were engaged in supply dropping operations in Italy. Returning to Army Air Force headquarters at Washington, D.C., in July of 1945, General MacCloskey was appointed assistant to the deputy chief of the Commitments Division; a month later assumed duty as deputy chief of the Flight Operations Division, and in March 1946 was named deputy chief of the Reserve and National Guard Division. Entering National War College in August 1947, upon graduation the following June he returned to Air Force headquarters to become chief of the Air Intelligence Policy Division. In August 1949 he was named Air Attach at Paris, France. Joining the Military Air Transport Service headquarters at Washington, D.C., in September 1952, General MacCloskey served as commander of the Air Resupply and Communications Service. His decorations include the Silver Star, Legion of Merit, Distinguished Flying Cross, Air Medal with seven oak leaf clusters, the French Croix de Guerre with palm and the Legion of Honor. He is rated a command pilot, aircraft and technical observer. 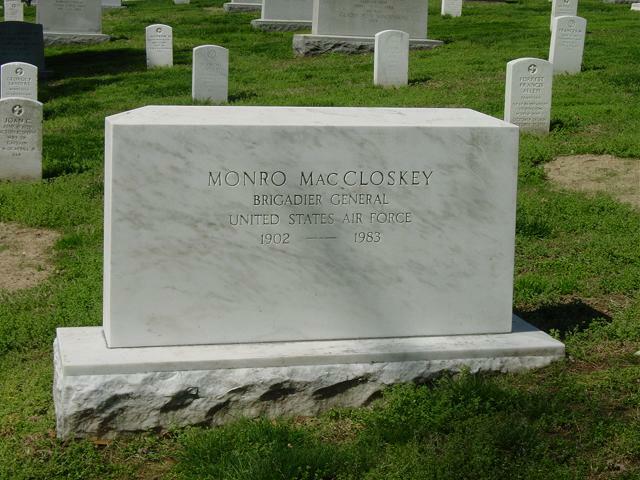 General MacCloskey died on 29 January 1983 and was buried in Section 30 of Arlington National Cemetery. He is buried adjacent to his father, Manus MacCloskey, Brigadier General, United States Army.